I painted this back when I still made my own stretcher bars and hand stretched the raw canvas, prepped it with gesso and marble dust, sized it with rabbit glue and primed it with lead based white oil. It is a layered painting (old traditional style process). I wonder how many oil paintings are out there with lead based paints today? They are only dangerous if you eat them! You are not supposed to touch them, either. For whatever reason, back then clown paintings were a favorite of mine. I only have three or maybe four of them still around, I will post the third known one next week. If I find the fourth one, I will probably make a set of prints of them. 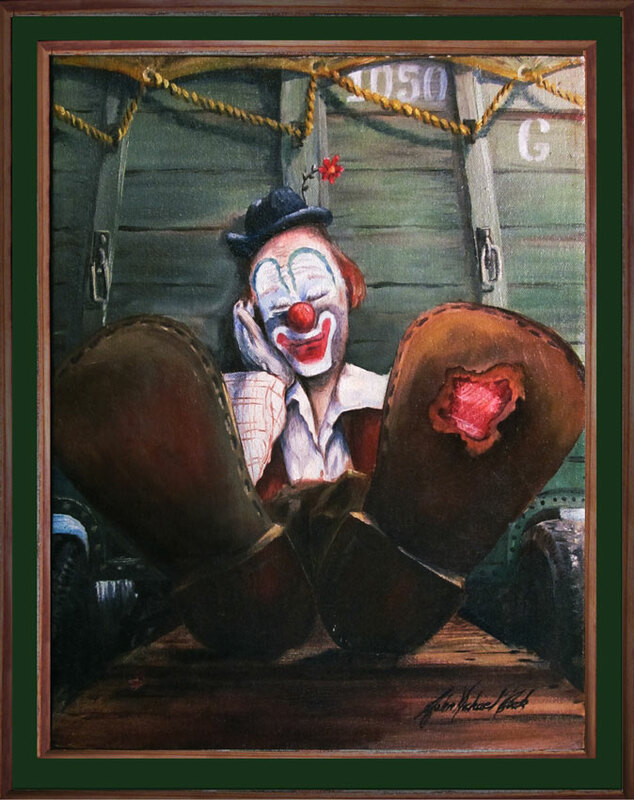 This entry was posted in Paintings and tagged circus, Clowns, Kingman Arizona, Oil paint, painting on April 14, 2013 by eightdecades.